child go through something like this. I'm sorry it has taken me so long to update everyone but it has just been so hard. We are putting our energy and grief into helping others with this disease. Tiffany lost her battle with lung cancer on 7/15/06. Since then we have started the foundation that she wanted to start (had she won against this horrible disease) We are still working on the site and welcome suggestions and additions. We have put a link back to this site as well. Oh gosh, I am stunned and very saddened to hear that Tiffany lost her battle to cancer at such a very young age. I HATE this disease so darn much!! Bless you and your family for starting a foundation in her name and wanting to help others! God Bless. First I am so sorry to hear this news of her passing. I am proud that you are continuing her Legacy in this way. You should get in touch with Katie and Tina Mynatt about the foundation. Tina has one dedicated to Her Late Husbsand, Charlie. I am sure they could offer a wealth of info about this. I am so very sorry for the loss of your daughter. I commend you on wanting to do something in her memory and help others. This disease is so cruel. Please accept my condolences on the loss of your daughter. My heart goes out to you and all who knew Tiffany. I visited your website, and want you to know that you have truly honored her with this beautiful tribute. Thank you for continuing to advocate on behalf of lung cancer. Somehow I missed this post last July. So today I find myself totally blown away by this tragic story. My heart breaks for all who knew Tiffany. What a beautiful young woman. May her foundation grow so her dream can come true. Please accept hy most heartfelt sympathy. You asked about knowing other young folks stricken by LC. Yes, a local young woman dx at age 26. She is married but 2 years.....is now 27 and suffers Stage 4 with several mets. Evil disease, isn't it? Tiffsmom, I am so so sorry for your loss. I truely believe that your daughter's battle can make a difference in the fight against this terrible disease. She is exactly the opposite of the stereotype that has been attached to lung cancer. Please continue to fight in her memory. I am just heartsick to hear of your daughters passing. I'm so sorry to hear that your daughter lost her battle. I am also on the younger side diagnosed with this disease. I was 6 months pregnant with my second son when I began having back pain I attributed to being pregnant. 6 weeks after my baby's birth I was diagnosed. I admire your commitment to your daughter's dream. I also want to help other young adults with this disease, and hope to do that in the coming years. She was absolutely right about the world being turned upside down when you're just starting out. I'm sure it's turned upside down whenever anyone is diagnosed, but I feel strange in my group of peers because everyone else is so healthy and carefree at this age. Again, I'm so sorry that you lost your beautiful daughter. I am so sorry for the passing of your beautiful, brave daughter. I just went to her site and it tore at my heart strings. She was beautiful and much much too young. I wish I had some words of comfort, but all I can say is Heaven received a beautiful angel. I know her soul will live on through so many memories she left behind to all of her love ones and all the lives she touched with her positive attitude and Never Giving UP! She may have lost the war but certaintly not the battle. We are always here for you. My deepest deepest condolences goes out to you. We really have to get it out there, that this disease is not just a old man's smokers disease. No one is immuned. In fact it seems so many non-smokers are getting diagnoised much more now than ever before. We desperatly need funding to find a cure. I am so glad you are striving on making a difference in Tiff's name. I'm so sorry for you incredible loss. My condolences to you and her entire family. I would be interested in knowing just how many young people in their 20's, 30's and 40's get diagnosed with lung cancer. Does anyone know? I am SO SORRY for your loss! My Sincere Sypmathy to you and your family. I don't have a count on how many young people get lung cancer, but I do know it's more common then your doctor's have shared with you. And sadly enough it's becoming more and more common. 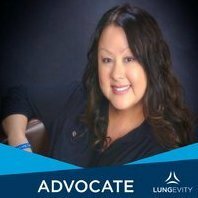 Lung Cancer is NOT just a smokers disease. MANY, MANY, MANY..... things can cause and do cause lung cancer. Radon is one, the air we breathe is two, the list goes on, etc, etc, etc. I was 43 when I was dx.d, I also run a Lung Cancer Support Group and have for the last 7 years, and we have had MANY young wonderful people (non-smokers) that have passed through our group, and some are still with us. We also have one young lady that was 26 years old when she was dx.d and she is now 32 years old and doing well. Sadly enough we just lost a wonderful young lady 3 weeks ago who was 30 years old and never smoked and she lived in a smoke free environment, as have many. I am sorry to hear about your loss. Cancer seems to strike any age. There are many children’s cancer centers around the country. I just feel something has change in our environment and daily habits that is increasing the chance of getting cancer. Let’s pray that the foundation will grow and help in a cure for cancer. You can always come here for support. Think of all the positive things that Tiffany has done and stay positive. I so so sorry about the loss of your beautiful Daughter! I have NO words just sorry.. Heaven has gained a beautiful angel! I know it doesn't make you feel any better but there is No pain where she is..
Hi Tiff's Mom, The pictures are beautiful. She was so young, and so pretty and just married. It is difficult to understand God's plan. I'm so sorry for your loss. It seems that lung cancer is attacking the young at greater numbers all of a sudden. My mother thinks it is the polution we breathe and the pesticides/hormones in our food source. The site you have developed in your daughters memory is wonderful. I hate this disease. I am so very sorry for your loss. It makes no sense at all. None. The site you have created for your daughter is so beautiful. What your family is doing is such a beautiful tribute to your darling daughter. I pray that you continue to get through each day with the amazing purpose that is driving you. No words can express how sorry I am about your daughter and her lost fight. Continue in her name to fight this monster. She was such a young person to have to go through what she must have endured. Thank you for telling us. I am so very sorry for the loss of your daughter. I SO HATE THIS DISEASE WITH A PASSION! A cure MUST be found soon! Very soon!!! The pictures of your daughter are beautiful! I hope that the website helps others who continue to fight the battle against this disease.